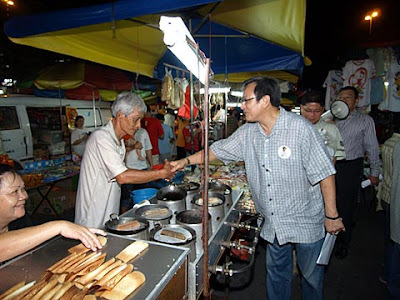 Wee Choo Keong was at the pasar malam at Taman Setapak on Wednesday night, 27 February 2008, to meet his constituents. 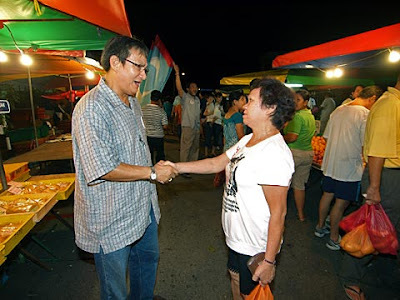 He is the Wangsa Maju parliamentary candidate under Parti Keadilan Rakyat (PKR) in the soon-to-be-held general election this March 8. 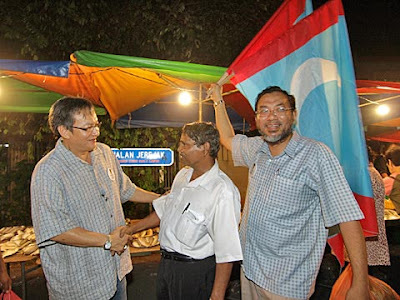 Also accompanying him was Dr. Ramzan (with flags), PKR leader for Wangsa Maju. Mr. Wee,You did right by taking heed of the feedback on your blogsite. Wee, we are with you. To annie …Thank you for pointing out the error. It’s noted and I will do the necessary. Have a great day. YES!! HIT ‘EM WHERE THE SUN DON’T SHINE WCK !! !Good on you for taking the feedback.Do try the morning pasars too.